The most impressive aspect of Alita: Battle Angel is its cliffhanger ending. The entire film teases a shadowy Big Bad, who is only seen in silhouette and then in the film’s final moments, played by a Surprise Big Name Actor, is alive and well and waiting to be conquered by our titular cyborg heroine. The impressiveness isn’t the execution of this ending, but that it exists at all. Clearly, director Robert Rodriguez and producer James Cameron believe the world will catch Alita Fever. They wouldn’t be terribly misguided to think so, despite the historic uphill battle of anyone seeking to make a tentpole franchise out of a non-comic-book property. (Alita is based on the 1990s manga series Battle Angel Alita, but so far adaptations of non-domestic comics have had a rough go of it at the American box office.) Alita: Battle Angel is an engaging piece of thoroughly computer-generated action pop, hokey and amiable and filled with enough set pieces to never drag. Its story is familiar enough that you can tune out once people start talking about how they “need to rebuild a quad servo” and still get the gist. 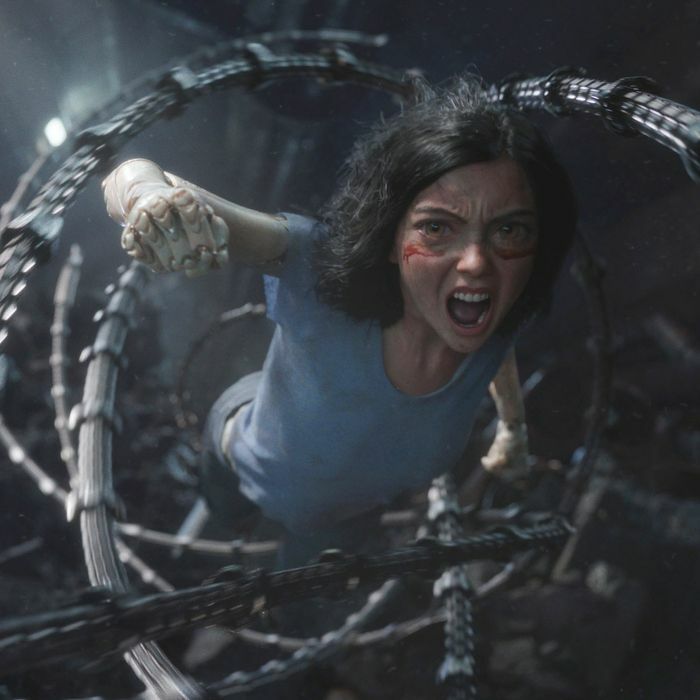 Alita has confidence in spades, which is enough to keep it afloat for its two-plus-hour run time. But it also has Rosa Salazar, who plays the title character, an amnesiac cyborg found in a junk heap by cybernetics doctor Dyson Ido (Christoph Waltz). And while most people reading this review will be curious to know if her character’s unnerving enlarged eyes will be either distractingly uncanny or full-blown nightmare material, I found I had completely forgotten about them by the second scene she’s in. Salazar, who plays this big-eyed, cyber-bodied version of herself through motion capture, is such a magnetic, sympathetic presence, that even through that layer of digitization she feels like an irrepressibly organic presence. When her dopey love interest Hugo (Keean Johnson) caresses her metal and purple-jelly hand and tells her she’s “the most human person I’ve ever known,” it doesn’t sound incorrect. After being salvaged and outfitted with a cybernetic body by Dr. Ido, Alita is effectively adopted by him — the body he gives her is one he had been saving for his dead daughter. (The mind reels at the subtext.) Then, as all cybernetic cyberpunk heroes must do at some point, she begins to try to piece together her past. Chiefly, she wants to know what she was doing in a pile of refuse from Zalem, the supposed utopian floating city that hovers above the more rough-and-tumble Iron City, and then, why she’s holding an arsenal of physics-defying martial-arts training inside her diminutive. But Alita’s “who am I” conundrum bypasses the predictable heavy-handed ennui usually found in the genre, because Alita is just too darn perky. She’s stoked on life on Earth; everything — especially anything having to do with conflict or Iron City’s countless blade-limbed, razor-fingered cybernetic bounty hunters — is thrilling and new to her. She’s Jason Bourne crossed with the Little Mermaid. Once Alita begins to unlock her potential as a Battle Angel, the movie has an awful lot to juggle — not only the origin of her advance-tech heart (so powerful it could power the whole city for a year!) but the people who seek to steal it for nefarious purposes, including Ido’s ex-wife Chiren (Jennifer Connelly), another cybernetics doctor who works with Vector (Mahershala Ali) to create superpowered cyberathletes to compete in everyone’s favorite sport, Motorball. Ah, yes, Motorball — a pretty great future-sport in the realm of ridiculous fictional future-sports, which the movie devotes a shocking amount of time to, and could have devoted even more time to if it wanted. Make a whole Motorball movie, James Cameron! The brutal sport kind of plays out like roller derby crossed with rugby, and it also happens to be one of the only ways a lowly commoner can hope to ascend to Zalem. Alita’s a natural at it, and decides to turn pro over the course of the movie. She also becomes a “hunter warrior,” the bounty hunters that are the only form of law enforcement in Iron City. Basically, Alita has a lot of jobs, but really only one true job: Battle Angel, a job that doesn’t even exist anymore since the War on the Moon (listen, do you want to know what that is, or do you want this review to come in under 1,000 words?) but makes her uniquely qualified for all the other ones. When she’s finally united with her true, 300-year-old super-regenerating cyberbody, a kind of peace and certainty settles on Salazar’s performance. Alita: Battle Angel is as much a story about body alienation and body acceptance as it is about a girl just trying to figure out the best career for her skill set, and when viewed that way, it’s quite relatable. Rodriguez’s action is punchy and engaging and legible — it’s a huge help that Iron City has outlawed guns, making all the action dependent on motion-capture martial arts and melee. One fight scene ends with a brutally damaged Alita springing off of her one remaining arm to defeat her opponent, and even though I knew I was watching an array of deftly manipulated ones and zeroes, I felt the urge to clap. But the only reason any of this works at all is Salazar and, I hate to say it, those goddamned big eyes. They’re the windows to the soul, after all, and this ungainly, lurching cyborg of a would-be blockbuster has more of that than meets the eye.